It's been a couple of busy weeks for me and I know I've been neglecting my stitch pattern library. Frankly speaking I've been missing it a lot. Finding interesting stitch patterns is so much fun. My favorite part is swatching. It's like unwrapping a present when you don't know exactly what's inside. The stitch patterns I add to the library do not always have photos. Sometimes it's just a chart or a written instruction and it's difficult to say how it will look like. 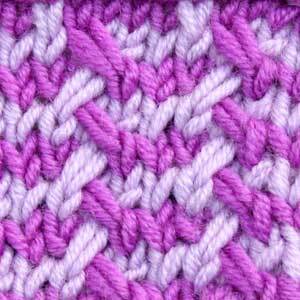 Here's a stitch pattern I added today. It looked somewhat gloomy on the original picture, but it turned out pretty in Orchid and Lilac combination. So, cast on a multiple of 5 stitches. 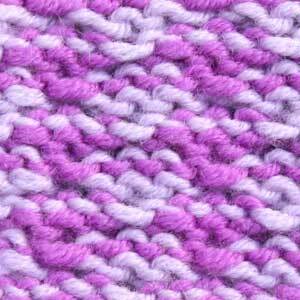 Add 2 more selvage stitches if you want to make a nice-looking edge. Row 1 (right side) Color A: *knit 4 sts, slip 1 stitch knitwise with yarn behind the work*, repeat from * to * as necessary. Row 2 and every wrong side row: work sts as they present themselves and don’t change color. Row 3 (right side) Color B: *knit 1 st, slip 1 stitch knitwise with yarn behind the work, make a 3 stitches right cable (slip 2 stitches to a cable needle and hold them to the back of the work, knit 1 stitch, return the slipped stitches to the left needle and knit them)*, repeat from * to * as necessary. Row 5 (right side) Color A: *knit 1 st, make a 3 stitches left cable (slip 1 stitch to a cable needle and hold it to the front of the work, knit 2 stitches, return the slipped stitch to the left needle and knit it), slip 1 stitch knitwise with yarn behind the work*, repeat from * to * as necessary. Repeat rows 3-6 as necessary for completing your project. You can also work according to the chart available at http://www.knitca.com/slipstitch8. Pattern repeat is marked by red frame.